Long term members, Warren and Gloria Sheather, share regular updates on their Northern Tablelands garden, Yallaroo, and now their new garden in the Blue Mountains. In the 2nd week of January 2018 we are featuring Lythrum salicaria, the Purple Loosestrife. This aquatic herb produces terminal spikes of pink or purplish-blue flowers in summer. Our plants die down in winter but bounce back in spring. Try Purple Loosestrife in a pond for spectacular flowers. See Water Plants in the Plant Database for more details. Starting before Christmas and extending into the New Year is when our Hyacinth Orchids (Dipodium punctatum) burst into bloom. This leafless terrestrial orchid sends up one or two flower spikes each holding up to 50 deep purplish, hyacinth-like blooms. They appear under eucalypts, on the edge of our road and in grassland. Our kangaroos are rather partial to Hyacinth Orchids as we sometimes find flowerless stalks that have been eaten off. Leptospermum spectabile is a rare tea tree from the Colo River near Windsor, NSW. L. spectabile is characterised by large red flowers and has been used in a breeding program by the Bywong Nursery, southern NSW. Leptospermum “Rudolph” is one of the progeny from this program. “Rudolph” was the result of a liaison between L. spectabile and a burgundy leafed form of L. morrisonii. L. “Rudolph” is an upright medium shrub with purplish foliage and red flowers. This is a classic hybrid that has inherited characteristics from both parents. Flower colour from L. spectabile and foliage from L. morrisonii. “Rudolph” is covered with flowers throughout December. When flowering is finished this hybrid is still an eye-catching plant with its purplish foliage. “Rudolph” will take kindly to cultivation in a container. Perhaps as a change from the usual a container-grown “Rudolph” could be brought inside and decorated as a flowering Aussie Christmas tree. More details, about this hybrid, are available from the Plant Database. In this first week of summer we are still at Yallaroo waiting, somewhat impatiently, for a buyer. This morning we took a walk around one of our grassland areas as respite from packing. A smell of chocolate was detected in the air. Amongst the grasses and herbaceous plants we found Chocolate Lilies (Dichopogon fimbriatus) beginning to flower. If we have good autumn and winter rains these delicate plants with their stalks of purple flowers appear in large numbers usually in company with Bulbine Lilies (Bulbine bulbosa). At these times the chocolate scent permeates a wide area. Chocolate Lilies planted en masse would make both an aromatic and visual impact in cottage gardens and rockeries. Perhaps this could be the dawn of a new plant science: “Nasal” Taxonomy, the identification of plants by aroma. I love the colour of the young flowers on robur and I was interested in the picture of a clump of flowers seen last weekend in a previous post. 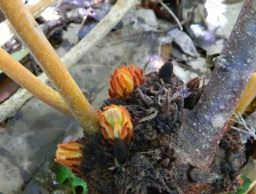 The plant in my garden also has multiple flowers, but on the woody lignotuber at ground level. As we approach the 2nd half of November, 2017 we have decided to leave Yallaroo after 20+ years and move to the lower Blue Mountains. It is time to move closer to the family. We will miss Yallaroo but are looking forward to creating a new garden in a different environment. We are going full circle. Our first home was in Glenbrook 54 years ago. This was when we first joined the APS and when the Glenbrook Native Plant Reserve was established. At our first meeting the plant on display was Kunzea ambigua. As a floral farewell the K. ambigua in our garden is in full flower.